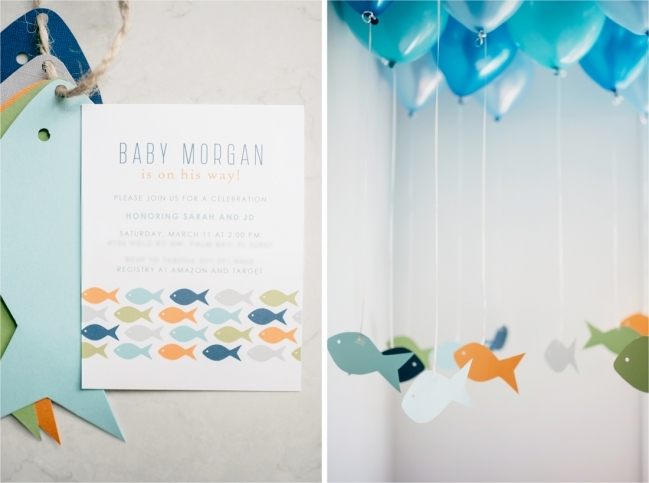 A Modern Fishing Themed Baby Shower Celebration That Will Reel You Right In! When planning a baby shower for my sister, Sarah, we took inspiration from baby boy’s name. Morgan means “bright sea.” That coupled with Dad-to-be’s love of fishing, and we were all set on the theme. We chose bright colors set against clean white to keep it modern and fresh. The invitation from Etsy seller, Olive & Star, inspired the color palette of navy, green, orange, gray, aqua, and white. Our family and friends joined us for a comfortable, relaxing celebration at our home. We set up the crib and nursery art in the entry. 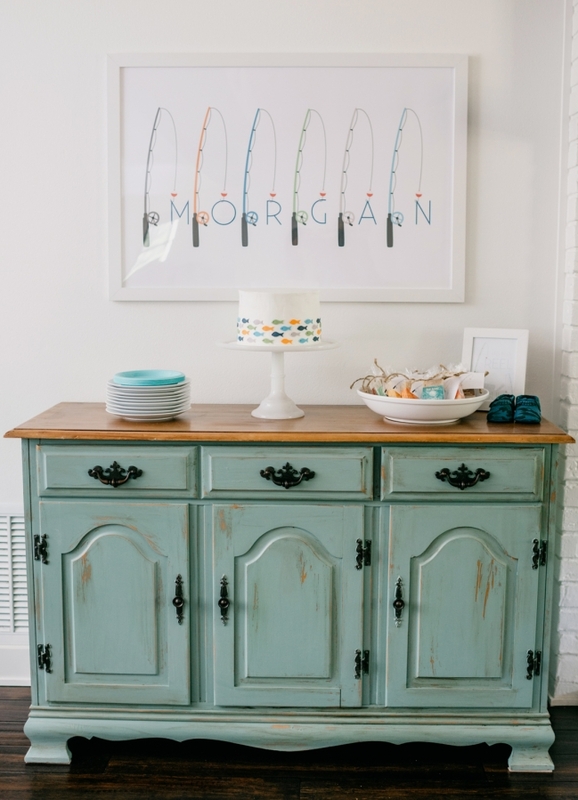 This not only served as party decor, but also as a unique way to present Mom-to-be with her gifts. As guests entered the house, they placed presents inside the crib. During the party, guests were invited to personalize a bandana bib with paint and a tie-dye kit as a sweet and useful keepsake for baby boy. The hands-on activity was enjoyed by all ages! Balloons with colorful fish tied to the ends hung from the ceiling for a festive, under the sea look. Finally, our other sister, Kinsley, gifted the nursery glider so we set it up in the corner of the living room as a comfortable spot for Sarah to open her gifts during the party. We loved coming together for a beautiful afternoon with family and friends to celebrate the upcoming arrival of baby Morgan! We are so excited for Sarah as she begins the journey into motherhood, and we can’t wait to meet our newest family member! Sweet Adelina is turning one, and her parents threw the sweetest birthday bash to celebrate the occasion! Here’s a little peek at the vintage-inspired brunch party which included the most gorgeous handmade details and yummy homemade goodies.